If it isn’t evident yet, one of the things I’m greatly wild about is wildlife. Animals in particular. While I haven’t been to the Galapagos yet (2016 update: I’ve now been!!! ), I’ve been fortunate to meet and see different kinds of wildlife when we travel and I don’t mean zoos. I like seeing animals in their natural habitats. To me there is no greater blessing than witnessing (and perhaps being welcomed) by nature to see how animals live without human intervention. Whenever we can, we try to see animals in the wild and avoid zoos if at all possible. However, there have been times that I wasn’t too proud of myself. Such as this time we were in Penang, Malaysia. I saw one of the most random things in a food court. Right smack in the middle of the food court was a python enclosed in a glass case. 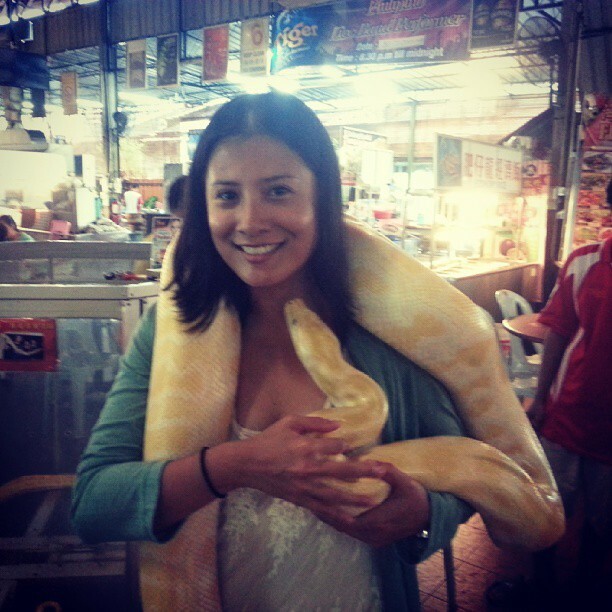 The python was beautiful and it felt really wonderful to hold it. But it must live such a miserable life inside that glass enclosure in the middle of a hot and sweaty food court! Situations like this, I feel rather conflicted. I would love to hold them, but I know that paying the photography fee is just encouraging the continued sad life of the python inside the glass. And at the same time, I know that a python in the wild is something that I will never approach. As it now gets easier to travel around the world and venture into national parks and the ocean, I thought I’d write my personal tips on how to photograph and approach or interact with wildlife. These won’t be technical tips, but more on preparation and how to ensure both yours and the animals’ safety. 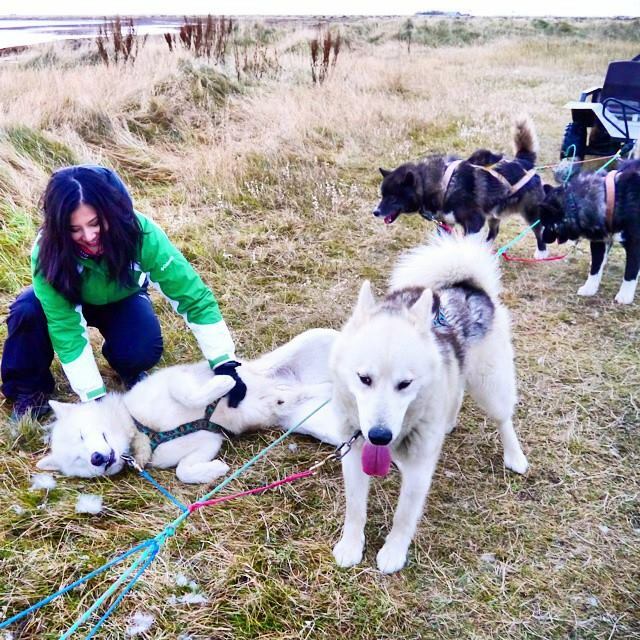 Please bear in mind these are no means expert advise, these are just our personal experience from travelling, and well, for myself: growing up surrounded by dogs! These tips do not apply for safaris where you can see big cats / rhinos because I have not done those yet. Animals behave according to seasons so you should do a little bit of background research so you’d know what to expect when you get there. 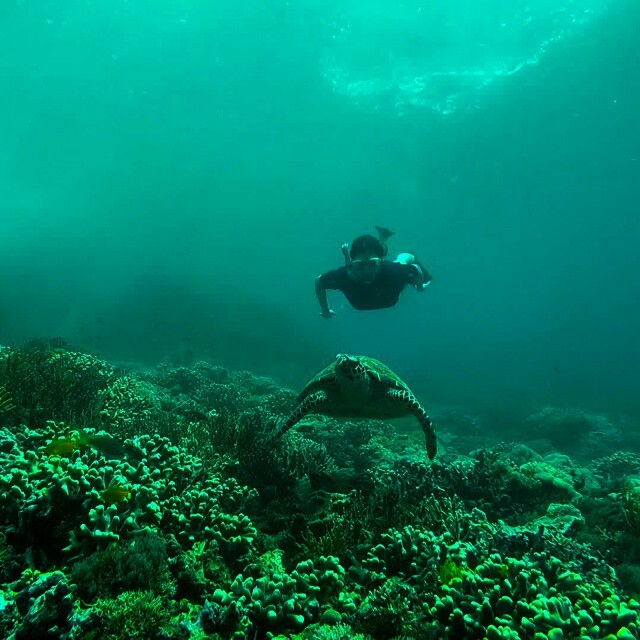 For instance, when we went to the Komodo Islands in January, we knew it was rainy season so we didn’t bother going scuba diving. 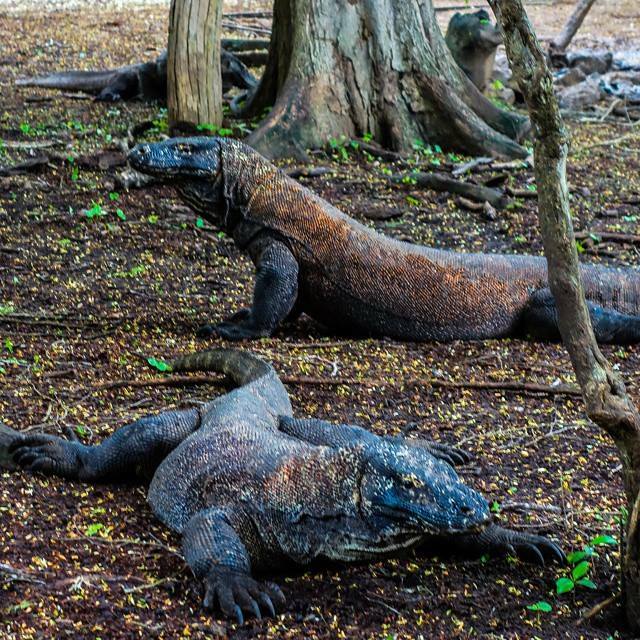 The Komodo dragons are there year – round, but it’s good to know that mating season is July – August so that’s the time when Komodo dragons are most active and probably aggressive. But know that when it comes to nature, there are no guarantees. 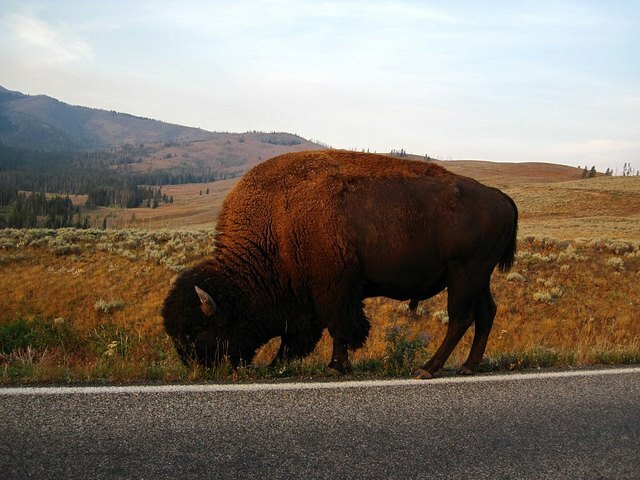 For instance, we went to Yellowstone National Park in September – October, a time when bears are usually active as they forage the woods and forest for berries in order to get ready for hibernation. We were there for a week, actively looking for them and in the early morning too (when they would usually be out) but we did not see a single one. We did see a lot more other animals though, as if to make up for the non-bear appearance. I’ve seen many news articles whereby people have been victims of animal attacks, and this is mainly caused by people trespassing the animal’s boundaries. All animals are territorial and even if you’re inching close “just to take a picture”, it makes no difference to the animals. To them, when you are too close, they will feel threatened and all animals either have a fight or flight reaction when they feel they are in danger. Do not wait to have an encounter with an animal that chooses ‘fight’ when in these situations. Also, when taking photographs of animals, it’s best to let them do what they are doing. Do not make noises or call out to attract them so they can “look” at the camera. They are animals, not people! If you’re trying to see animals in the wild, always remind yourself that this is not a museum where your eyes are guided where to look. The adventure lies in that you need to look everywhere, as the animals can really be just around the corner. 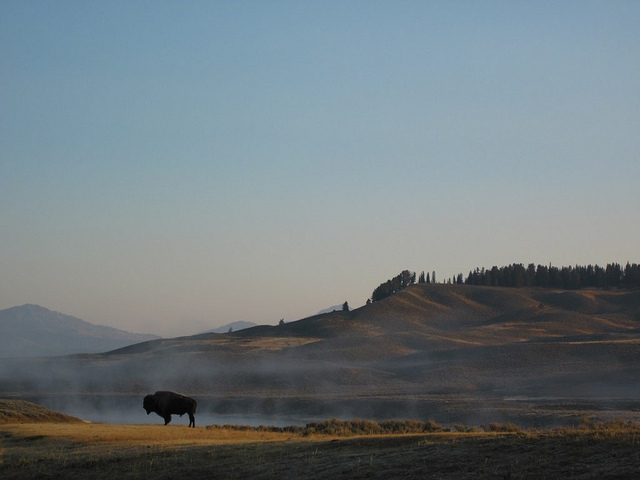 As an example, as we were driving around Yellowstone, we stopped and got out of the car to check out a lake. 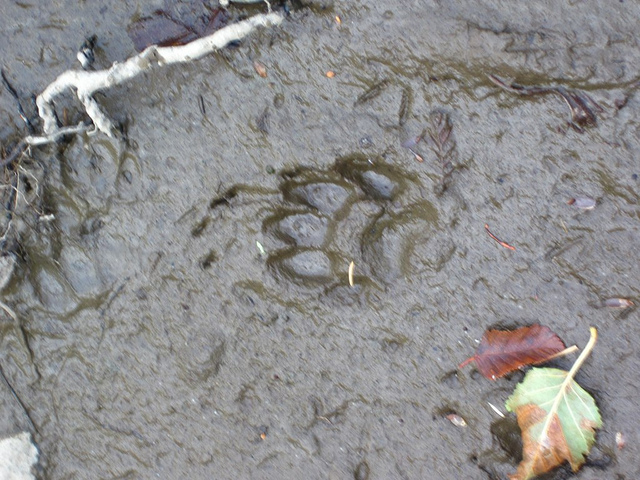 After 10 minutes, we were about to head back to the car when we saw this fresh pawprint on the mud (above). 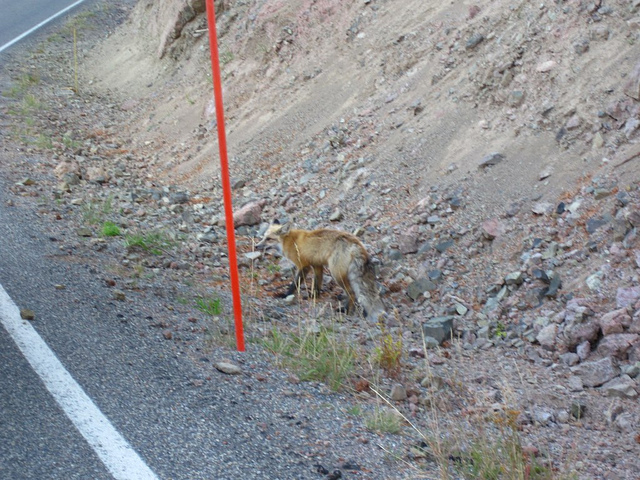 A coyote prowling the road. Coyotes are lone hunters, and we saw about three in different occassions throughout Yellowstone. Binoculars aren’t just for ornithologists or bird enthusiasts. As I said, you really need to keep your distance when trying to look for animals. There are a whole lot of travel-friendly binoculars in the market. 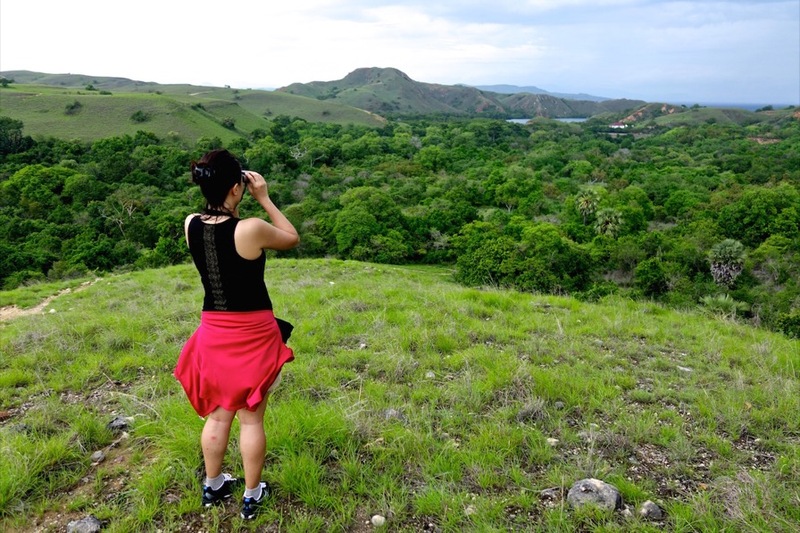 When we went to the Komodo Islands, I took with me the Swarovski CL Pocket Binoculars which were really handy and did help in spotting wildlife. Meaning, do not lure animals with food just to get them to appear so you can get a shot of them. Do not call out to them either. Always remember you are the guest in their habitat. It’s time to be just the observer and do it as unobtrusively as you can. What’s fragrant for human noses can be offensive to animals. Remember, most animals have a great sense of smell. Dogs can smell 40 times more than humans so what’s mild to you may be really offensive or nauseating to dogs. Having no fragrant / strong smell makes an animal be at ease around you. Ok, obviously this tip only applies if you already know how to swim. If you don’t, forget about it. Just keep the vest on. No photograph is worth more than your life. I find life vests very restrictive when worn. You can’t even swim properly, you are always in an upright position and more importantly, you can’t even get to where the sea creatures are. Even if it’s sooo tempting and they’re so close, underwater creatures are not the types of animals you can pet or stroke. Also, when observing sea creatures underwater, try to have your body always in a horizontal level. 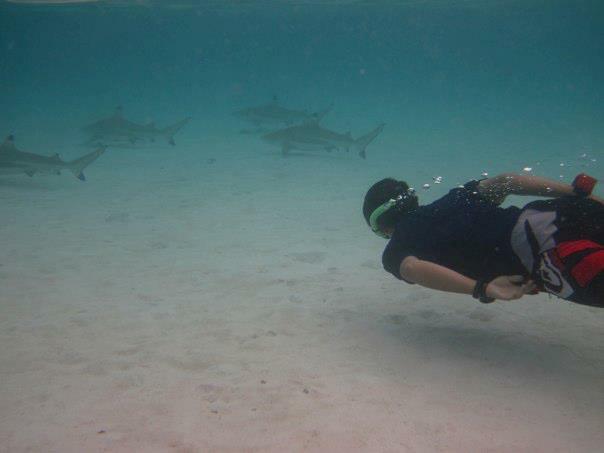 Sharks, fish, sting rays – they are not used to seeing bodies in an upright position, and when observing animals, you should always be very quiet. Entering and exiting the water with as little splash as possible. And needless to say, do not create a lot of splashing, waves and bubbles. My pet peeve are those who get into a kicking frenzy underwater, not only obstructing other people’s views but also scaring all the fish away! 10.) Observe others. Observe animal’s behaviour. If you are unsure how to approach or handle an animal, yet would love to, observe the handlers and ask them questions. And you also need to observe an animal’s behavior. Just a bit of common sense, for example, a handler keeps insisting that Fifi the Husky is very tame and you can come and pet her, but Fifi has her fangs out and is snarling at you, don’t even risk it. Also learn to observe how different animals express tension. I fortunately have never encountered a shark that went curvy on me! With horses, it’s all about the ears. If a horse’s ears are facing forward or are pricked high (as above) it generally means they are interested and are listening. I am so in love with this horse, I swear it’s even smiling! Now if a horse’s ears are flattened, beware. It generally means they are annoyed. Same if they keep stomping on the ground / restless – but this could mean both that they are excited or are currently irritated at something. Horses’ body language can give double meanings. Like a bared teeth can mean anger, but can also mean they are showing affection. So you have to take it on a case by case basis and see what is happening around to know which kind of expression it really is. As much as I have a lot of photos with animals, what’s not taken or documented often are how I play / interact with them first before we take photos. Just like humans, they need to get to know you first before they even feel a little bit at ease with you. Just put yourself in their situation, if someone just sat next to you and posed for a shot, you wouldn’t like that either. I’m lucky to have Zombie usually take photos of me playing with animals, as these are usually more fun than the “posed” photographs. Feeding this white beauty some oats. Idaho. Let’s just say you consider yourself a pro with dogs and horses and you’ve had great interaction with them before. It doesn’t necessarily mean that you are now fine to do the same with all other horses and dogs. 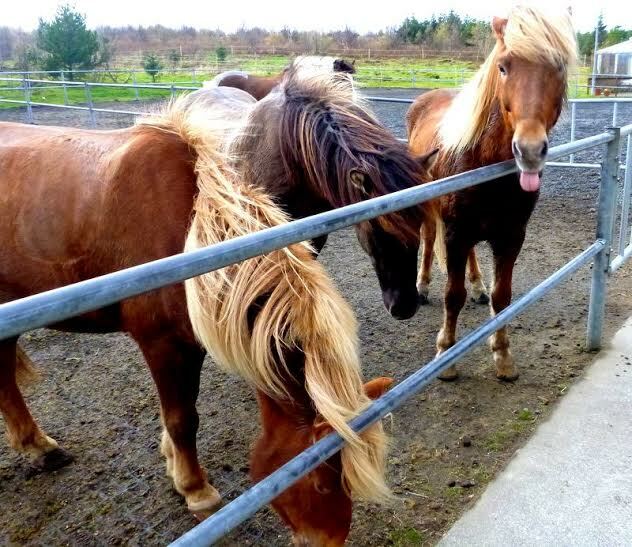 Take for example, the Icelandic horses. They may be smaller than your usual horse, but they sure have big personalities. And though they’re friendly as well, they’re more independent than other horses. 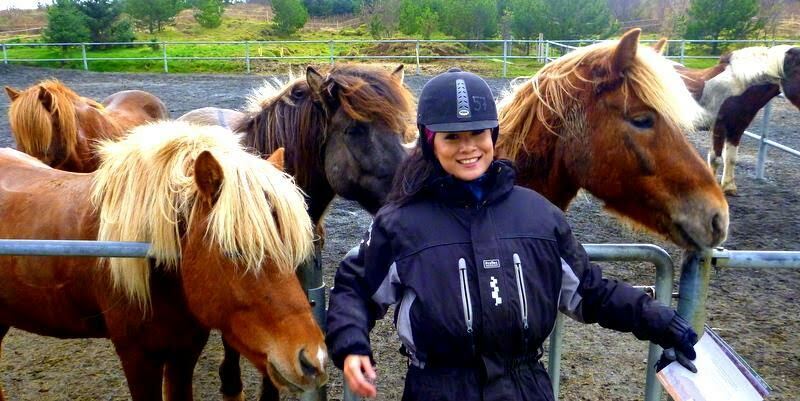 Believe it or not, those giant horses from Idaho seem like statues compared to these Icelandic horses who love to frolick and play. 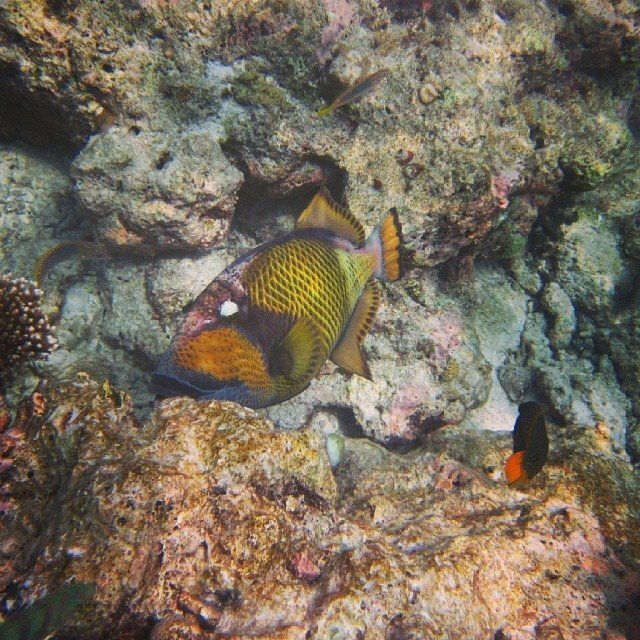 Same with underwater creatures, it will help to identify different kinds of saltwater fish. Animals can really sense if you are nervous, afraid or stressed. And if you give of that vibe, its natural for the animal to also feel threatened. I’m no Bear Grylls at all, but I know for sure that there are more reasons to be afraid of humans than animals! Now having said all the above, there are still a couple of animals that I’m quite petrified of and you will never ever see me come close to them. Give me a snake, tarantula, or iguana anytime. Certain birds like budgies and small parrots I can handle, but never the big type of birds. And monkeys too. Ok what about you, what animals do you love in particular and are there any you’re afraid of? 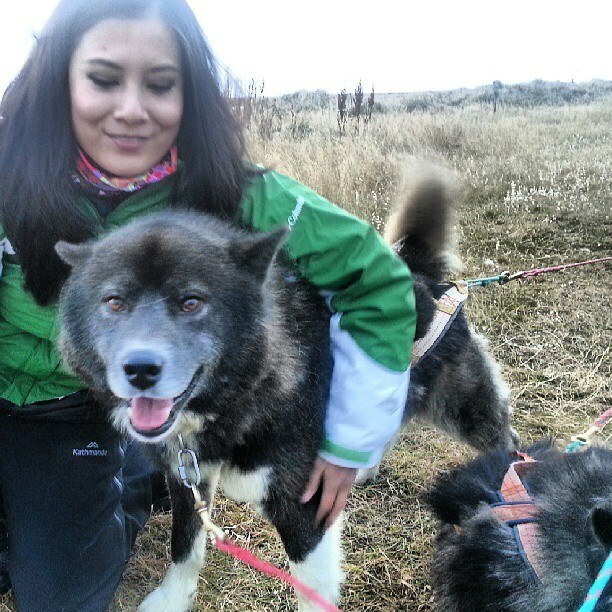 I love dogs a LOT at the moment, so I’d be super keen to hug a husky. Not a fan of snakes and spiders and bugs and lizards and anything that is slimy. Some fish make me scared too. Hello, I love underwater animals of all descriptions. Enjoyed a recent meeting with two octopus in Fiji. Orang Uganda and proboscis monkeys also a delight! Very cool post, and I learned a lot here! 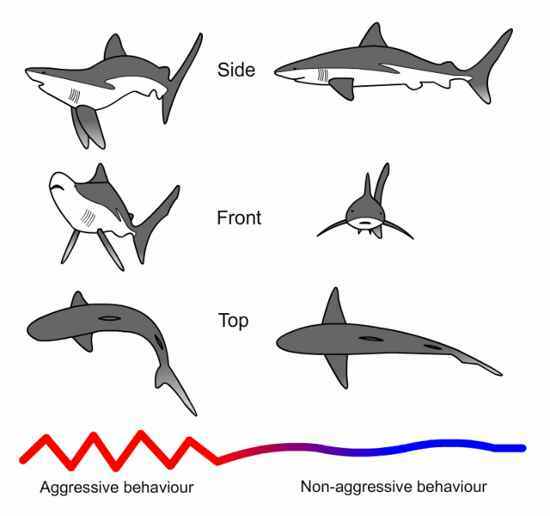 In addition to your photos, I also love the diagram with sharks aggressive and nonaggressive posture. Over 10 years ago we snorkeled in the Great Barrier Reef (I sure wish we had photos of that). 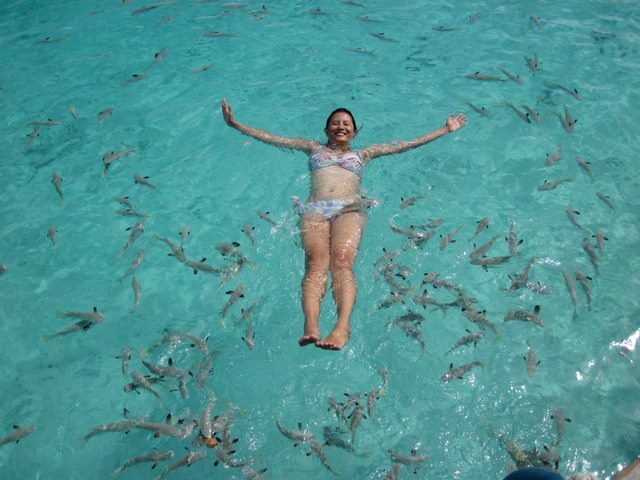 I honestly didn’t want to do it because I was scared of the reef sharks. We didn’t see any of those but I am so glad Bell convinced me to do it. It was a great experience. 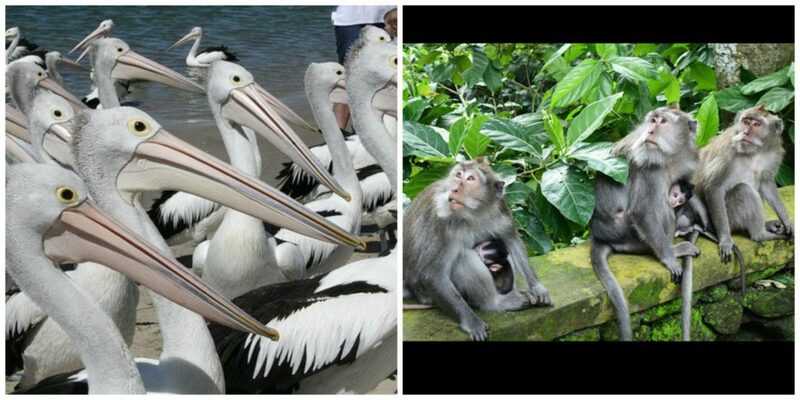 Outside that, our most epic encounter with wildlife was in Malaysian Borneo. It was wonderful to be 50 feet away from a herd of endangered pygmy elephants on foot, before a drunk Aussie guy scared them into the jungle because he started yelling because his flip flop got stuck in the mud.